LEGO The Lone Ranger Colby City Showdown features opening door, jail with exploding wall function and rooftop cannon. Includes 5 minifigures with weapons and accessories…. The bandits are robbing the town bank! The Lone Ranger must stop them from escaping with all the loot. The rooftop cannon will surely stop them. LEGO model number: 79109: Go after the bandits when they rob the town bank in a Colby City Showdown. Fire the cool rooftop cannon as the bandits blow up the vault and try to steal the silver. Includes the Lone Ranger, Tonto, Texas Ranger Dan Reid, 2 bandits, the sheriffs office, the bank,a small wagon and various weapons. For ages 8 years and over; EAN: 5702014972551. WARNING(S): Not suitable for children under 3 years old. To be used under the direct supervision of an adult. 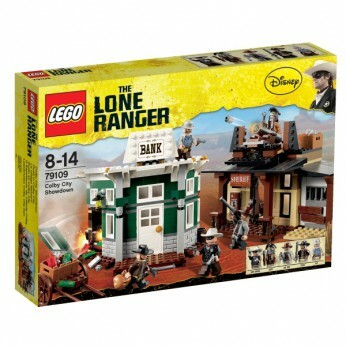 Stop bandits from stealing the silver with the Lego Lone Ranger Colby City Showdown 79109. Crooks Ray and Frank have busted out of jail and are robbing the bank. Use the dynamite to blow up the vault and steal the money. Fire the rooftop cannon and help the Lone Ranger, Tonto and Dan Reid put the outlaws back behind bars! This detailed set features 587 pieces and includes: 5 x Minifigures: the Lone Ranger, Tonto, Dan Reid, Ray and Frank. Weapons: 3 revolvers, 3 rifles and a tomahawk Sheriff’s office with opening door, exploding jail wall and a rooftop cannon Bank with opening door and vault Wagon Accessories: sack, dynamite, bottle, handcuffs, keys, barrel and 2 silver bars Great for Wild West fans aged eight and up. This toy costs approximately £39.99 (for the latest and best prices make sure you check our retailer list for the LEGO The Lone Ranger Colby City Showdown 79109 above). In our review of LEGO The Lone Ranger Colby City Showdown 79109 we classed it as being suitable for ages 6 years, 7 years, 8 years, 9 years, over 10 years but recommend you check the manufacturer specific advice before purchasing.